If you’ve ever attended PAX on either coast, you know that it is a great opportunity for a lot of things. Fans can meet makers and other fans. Developers can speak about things that they’re interested in or passionate about to a crowd. Press can get tasty tidbits, and marketers can reach a wide audience. One thing that is nearly impossible is actually getting any work done. Even as a measly blog trying to write up the spectacle, we had a hard time tearing ourselves away from the hypnotic flashing lights and the blasting video game siren call. Now try to imagine the challenge, as a developer, of trying to track down and connect with important industry contacts. Well, for the game developers planning to attend PAX Prime, this may not be an issue. A small pre-convention that they are calling PAX Dev is being launched in the two days preceding PAX Prime. There, developers and other game industry professionals will be able to meet, greet, and network, unmolested by throngs of fans and (sniff sniff) press. Okay, so my fellow journalists may not be welcome, but I’ll let this one slide if it helps streamline the process of getting good games made. You can get the full scoop below. And while you’re checking it out, why not register for PAX Prime itself, since tickets are now available. SEATTLE — April 15, 2011 — PAX Dev will bring together programmers, designers, producers and artists to explore the craft of creating digital and physical games. The show will take place Wednesday, August 24 and Thursday, August 25 (the two days preceding PAX Prime) at the Sheraton Seattle Hotel. PAX Dev is designed to be an intimate event where game developers can concentrate solely on the art of game development. To be sure the focus stays on development; there will be no marketing buzz from an exhibition hall, no bizdev speed dating events and no PR opportunities with press. PAX Dev is purely about open and honest sharing, learning and debate. In the tradition of PAX events, the show will cover video games as well as pen and paper, tabletop, board and collectable card games. “There is this odd distinction where some shows are just for video games or just table top and collectable cards or just board game. But we’ve all seen how ideas in one segment can feed and influence innovation in another part of the game industry. Having representatives from all of the extended game development family can only make PAX Dev stronger,” stated Khoo. Early registration is $249 (at the door pricing is $329) and approximately 750 tickets will be sold http://dev.paxsite.com/registration.php. 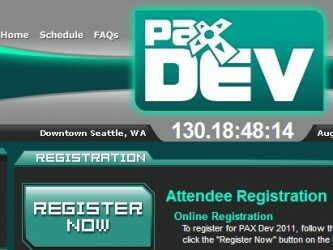 Individuals interested at presenting at PAX Dev can submit panel applications at devpanels.paxsite.com.